Kate Donovan has been praying for her future husband since she was in the fourth grade, but now that she’s thirty-one and still single, she’s starting to wonder whether she should buy a couple of cats and be done with it. A trip to renovate the old family home, Chapel Bluff, in Pennsylvania with her grandmother provides Kate with a well-needed break from the monotony of everyday life. She’s looking forward to spending some quality time with Gran and having a look at the old antiques, buried inside Chapel Bluff. She’s not expecting that their building contractor would be the stunningly handsome Matt Jarreau, former NFL hockey legend. Matt gave up his sporting career when his wife died suddenly from brain cancer, and isn’t much of a talker. But Kate doesn’t give up easily, and soon Matt’s crawling out of his shell and participating in family meals and poker nights. Kate believes that her job in Redbud is done when Matt finally begins to discuss his wife and come to terms with moving on with his life. She certainly doesn’t think that her time spent with Matt could ever make it beyond the friend stage – but that’s just what happens. But as her time in Redbud draws to a close, Kate begins to question whether she was right in developing a relationship with Matt when he still has so many demons from his past that he needs to battle. Is there any hope for Kate and Matt, for a skinny social worker with a penchant for antiques and a former hockey legend with a lot of skeletons in the closet? If you’ve read any of my other reviews, you’ll know that my usual forte is historical or Amish romance. While I ate up plenty of chick-lit novels in my teen years, I’ve never been one for straight-up contemporary romances. Perhaps it’s because I’ve occasionally mused over my own romantic experiences and thought, “Wow, my life would make an incredibly boring romance novel!” I’ve dated one guy in my entire life and nothing particularly exciting has happened in our relationship, and I actually hope that nothing novel-worthy happens once we’re married. Most people’s lives aren’t anything like a book, thankfully. But we all want something a bit more exciting when we escape into the world of fiction, and perhaps that’s why I prefer historical or Amish novels to contemporary ones – they’re nothing like my life. Thus I began My Stubborn Heart a little cautiously, unsure of what I was getting myself into. My other worry with My Stubborn Heart – beside it being totally outside my comfort zone – was that I wouldn’t be able to relate to the heroine. After all, what has an almost-married, curvy (not quite Christina Hendricks, but my hips do like to compete) twenty-year-old university student got in common with a single, skinny thirty-one-year-old social worker? I always have this fear with older, single heroines that I’m not going to be able to relate to them in any way, but this fear was completely unfounded when it came to Kate. She may have had more life experience than me (except in the wedding planning department) but I immediately fell in love with her down-to-earth sense of humour and brutal honesty when it came to all things in life – the dress sense of her grandmother’s best friends, her angst over her bra size or her belief that man’s role on earth is to empty the rubbish bins. Young or old, I’m sure any woman will be able to appreciate Kate on some level. As well as her wonderful personality and attitude towards life, I also loved her desire to do good, which ultimately fuelled her relationship with Matt. She saw someone hurting and wanted to help him. Her attraction for Matt wasn’t motivated by anything selfish. I honestly wish I could be more like that. When it came to Matt, I appreciated that he didn’t completely follow the alpha male stereotype. I’m not one for muscled, dark, brooding heroes – my fiancé is a computer scientist, so he’s the pale, slightly skinny type who definitely doesn’t spend two hours in the gym every day. While I got a bit fed up with the descriptions of Matt’s toned figure or muscled chest, I did like the way that Becky handled his grief over the loss of his wife. Matt’s struggles with his past seemed realistic and his spiritual journey blended in nicely with his emotional difficulties. None of his actions seemed manufactured or forced to fit in with the romantic or faith aspects of the novel. On the other hand, I did find that Kate’s spiritual struggles at the end of the story didn’t quite fit with the vision I’d had of her throughout the novel. She seemed like a pretty firm Christian with a solid faith in God, so the changes that briefly occurred at the end of the book didn’t convince me. This part of Kate’s faith was also slightly glossed over and almost felt like it’d been thrown in to make a point, and definitely needed to be developed further to be truly believable. Other than my slight qualms with Kate’s spiritual journey, I didn’t have any major issues with the plot of My Stubborn Heart. It was a fairly conventional storyline, but the quirky narrative style and realistic characters made me forget how many times this plot has been done before. The secondary characters of Kate’s grandmother and her friends definitely gave this novel some of its originality, and Velma in particular definitely got a few laughs out of me. However, there were a few, very minor plot details that niggled at me that I feel I should mention. I found it amusing the first time that Kate’s friend, Theresa, mentioned that she had a crush on Matt, but this was mentioned every time that Theresa appeared in the book and I found it a bit disconcerting that a married woman would make such a fuss over another man. It stopped being funny and ended up being a little bit sad. My other difficulties were with aspects of the story that I felt might alienate certain Christians; namely Kate taking yoga classes and celebrating Halloween. I know plenty of Christians who won’t participate in either activity, and for this reason I would have avoided mentioning either of them just to be on the safe side and not alienate any potential readers. I didn’t mind the yoga so much – it could easily have been aerobics or Zumba, considering how little it was mentioned – but I felt a little awkward during the Halloween scene, considering my personal convictions on the “holiday”. Ultimately, my issues with My Stubborn Heart are fairly minor, and may even verge on nit-picking. 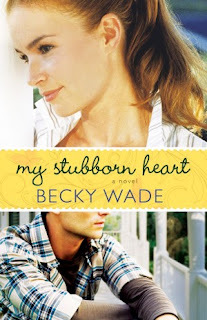 It’s hard to rate a book from a genre I don’t normally read, but even I can tell that Becky Wade’s debut in the contemporary romance market is going to be a big hit with its usual readers. Becky has a strong voice that readers are going to love, and her novel is full of characters with well-developed personalities. This combination of factors grabbed me from the first page and made it very hard for me to put this book down. Contemporary romance won’t be taking the place of Amish fiction in my life, but it may have made a convert of me already. For that, My Stubborn Heart can take all the credit. Review title provided by Bethany House. Sounds like a fun book! I have this on my "to read" list. Have a good Monday.